BROAD AREA MARITIME SURVEILLANCE (BAMS) - Gulfstream. Boeing, with an unmanned (and optionally manned) version of the Gulfstream G550 business jet. Boeing unveiled its bid for the US Navy's Broad Area Maritime Surveillance (BAMS) programme at the Paris Air Show June 19th, 2007. Northrop Grumman, with a marinized RQ-4 Global Hawk. 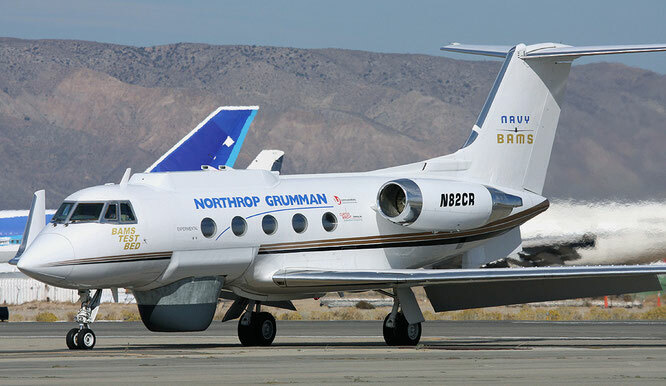 In order to begin testing the surveillance package early, Northrop Grumman contracted with Flight Test Associates of the Mojave Spaceport to modify a Grumman Gulfstream II as a flying testbed. Lockheed Martin, with a General Atomics MQ-9 Mariner. The awarding of the contract was expected in the fall of 2007, but in October, 2007, the Naval Air Systems Command (NAVAIR) pushed back the contract award date until early 2008. On 22 April 2008, Northrop Grumman received the Broad Area Maritime Surveillance contract worth $1.16 billion. In September 2010, the BAMS aircraft was designated the MQ-4C. The MQ-4C System Development and Demonstration (SDD) aircraft was delivered in 2012. The MQ-4C Triton performed its first flight on 22 May 2013. Full Operating Capability (FOC) planned is in 2023. As mentioned Boeing was offering the BAMS 550, a derivate of the Gufstream G550 long-range business jet. The proposed outer mould-line changes to the G550 - including the canoe radome under the fuselage and satcom antenna on top of the fin - were already FAA-approved and flying. A substantial sensor-fit was selected by Boeing and included an APG-79 active electronically scanned array radar mounted in the nose and two more AESAs carried back to back in the canoe. Raytheon would supply all three multi-function arrays, which were integrated to perform surveillance while the APG-79 would provide a sense-and-avoid capability. The baseline proposal was for an unmanned aircraft, with the capability to put pilots on board offered as an option. 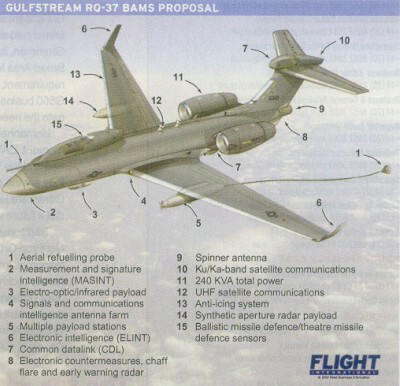 The Boeing proposal was based on the Gulfstream Aerospace Corporation RQ-37 BAMS proposal. Gulfstream have been slow to enter the UAV market and rather than risk the costs associated with developing a completely new UAV to compete for the BAMS UAV contract, instead they proposed an unmanned version of their successful G550 long-range business jet. Known as the RQ-37 this aircraft would use a fully automated flight control system developed by Sierra Nevada Corporation to convert the aircraft for unmanned flight. The main advantage of the RQ-37 would be its ability to carry a payload of nearly 10,000lbs for 15 hours up to altitudes of 60,000ft, a far greater payload than either of its competitors could manage. A typical configuration for the RQ-37 would include a synthetic aperture radar, an electro-optical / infra-red sensor, an ELINT / ESM suite and a ballistic/theatre missile defence sensor all routing data through a reconnaissance management system to data link and SAT Comms systems. If the payload was reduced around 5000lbs, the RQ-37 could then be fitted with additional fuel tanks and under-wing hard points and could operate for up to 18 hours, but still some way short of the endurance offered by the RQ-8A and Mariner. Despite its many virtues, cost was the real achilles heel of the RQ-37, with a unequipped G550 costing over $10 million more than a RQ-8A and an even greater cost disparity existing against the Mariner. So what about the Northrop Grumman GII testbed? Used was GII-SP N82CR c/n 80. After a career started in 1970 it was bought by Northrop Grumman 16 May 2006. The current registration, N82CR, was applied on 2 June in the same year. During the BAMS test period the aircraft was frequently noted at Mojave airport. It was also used as Aerial Common Sensor (ACS) testbed. Currently N82CR is wearing titles as a testbed for the Multi-Function Active Sensor (MFAS) radar system. This multi-function active sensor is to be used on the MQ-4C. First flight of c/n 80 took place 20 January 1970 as N827GA. The Certificate of Airworthiness was issued on 24 January and delivery to Page Gulfstream for outfitting the 14th of May. After outfitting the aircraft was owned by Pittsburgh Plate Glass Industries and El Paso Natural Gas Company in Texas as N85V. In 1996 the GII was converted to GII-SP (no. 41) before serving since 1997 as private transport (registration N500RH and N510RH) for the Hendrick Motorsports NASCAR race team of Rick Hendrick. Over 250 Gulfstreams are currently withdrawn from use, preserved, broken up or written off. A lot of them can be found at various places all over the world. The Gulfstream out of service download file gives a complete overview in convenient PFD format! Gulfstream aircraft can be chased all over the world. In recent years I visited the US, China, Japan, South Africa and several countries in Europe. But my home country is still The Netherlands and also there at several airports great Gulfstream airframes can be seen. This report shows the pictures made during my NL day trips and will be updated during the year. Northrop Grumman has settled on a Gulfstream G550 business jet proposal for the U.S. Air Force’s J-Stars recap competition. The US Navy has ordered a single Gulfstream G550 business jet based on the special-mission Israeli airborne early warning type for adaptation into a long-range, high-speed test range support aircraft. When searching the internet or reading aviation-related magazines and books it seems there is no uniform use of Gulfstream aircraft type- or sub-type designations. Gulfstream reports. did an investigation, based on various sources, to identify the correct Gulfstream aircraft designations. Boeing unveiled its bid, the BAMS 550, for the US Navy's Broad Area Maritime Surveillance (BAMS) programme at the Paris Air Show June 19th, 2007. The aircraft was later known as the RQ-37. To build the busiest airport in the country was an idea sparked by two aviation enthusiasts (Fanie Haacke and Abe Sher) in the 70’s. In 1974 the dream became a reality and Lanseria Airport opened it's doors to privately operated aircraft. The airport was officially opened by the Minister of Transport at the time, Hannes Rall, on 16 August 1974. A February 2016 visit was made to see the active and wfu Gulfstreams based at Lanseria. The High Altitude and LOng Range (HALO) Research Aircraft (based on a Gulfstream G550) is the research aircraft for atmospheric research and earth observation of the German science community. 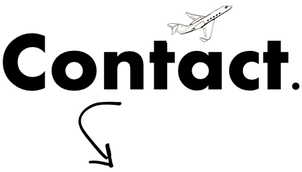 This website is dedicated to the legacy of Gulfstream and is not owned by or affiliated with GAC.